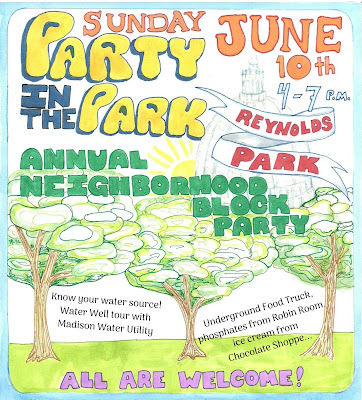 This annual party in Reynolds Park is the perfect way to kick off the summer. You'll find a casual gathering for neighbors to enjoy amazing food and drink provided by our unique local businesses, watch performances by local talent, relax among friends and get to know new neighbors. What do you know about the water you drink? Come and learn to appreciate the groundwater that is pumped into our taps! We are grateful to Madison Water Utility for annually providing a tour of the Water Well hiding under our neighborhood tennis courts and bike polo court. 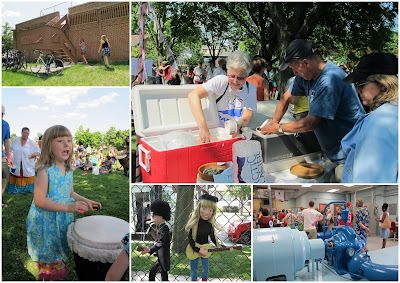 With support from Cork n' Bottle and many of the area businesses, the Party in the Park is a fundraiser for for Lapham Elementary School and park projects! Below are photos from past years. 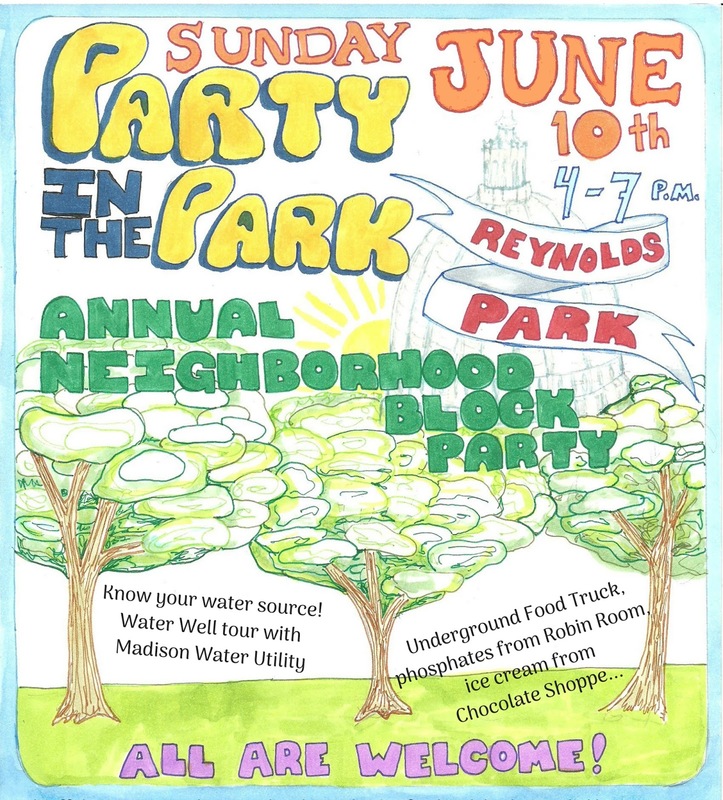 The Friends of Reynolds Park are working to make our park more friendly and fun for all our neighbors. Read more from me about Reynolds Park here. Reynolds Park is a full city block of greenspace just down the hill from the Wisconsin State Capitol. Madison, Wisconsin has 260 parks, which ranks the city number one for parks-to-people ratio. Reynolds Park is located in a densely populated downtown neighborhood. Over 60% of people in the Tenney-Lapham neighborhood rent and that number is growing as more high-rise buildings are going in all around the park. Reynolds Park sits kitty-corner to the historic and newly renovated Breese Stevens field, which hosts sporting events, concerts, and other large events regularly. It also sits conveniently between the cafes, restaurants, and shops of the neighborhood's two commercial strips, East Washington and East Johnson streets. At the 2013 Tenney-Lapham neighborhood block party, we hung some modest posters asking for input from neighbors. The take-away was that people would like more things to do in the park. We have been part of planning the Party in the Park on a Saturday at the end of June since. Money raised at the Party in the Park has been used to plant fruit trees in Reynolds Park. These new saplings line the side of the Madison Water Utility building facing Festival Foods parking lot along East Mifflin Street. 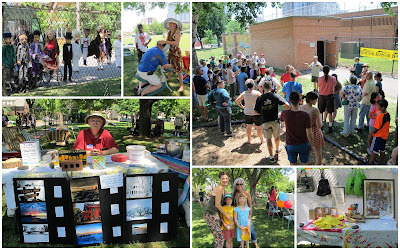 At the first Party in the Park, we raised money to adopt the two mature Ash Trees near the playground. This means paid to have the trees treated in hopes they will survive the coming blight from the Emerald Ash Borer. Read more here. You may have noticed the new playground equipment at Reynolds Park. In 2013, a few of us who had expressed interest in the playground found ourselves learning about the local processes of working with the city Parks Department, getting excited about the range of playground styles out there, and finding new allies within the neighborhood (Huge thanks goes to Ken Saiki and associates for invaluable input). The new playground equipment was installed in 2014.